So these muffins were the official goal for my normal Saturday baking. As with the previous night's Plum Cake Disaster I tempted fate by experimenting with the recipe. Since I had these gigantic mutant zucchinis that my cousin grew (I swear he injects them with some type of vegetable steroid) I felt that I should make either zucchini muffins or zucchini bread. 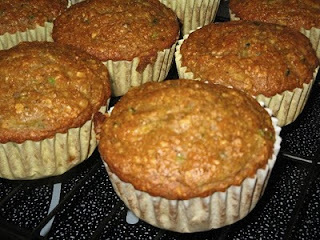 Muffin add ins are pretty interchangeable and I couldn't find any bread recipes that I liked, so I settled on finding a carrot muffin recipe and replacing the carrot with zucchini. The only thing I was unsure of was the proportion of carrot to other ingredients so I went to Catherine Robertson's blog Cat Can Cook and checked out her basic carrot muffin. But this was just a base for the proportions (even though I mucked with those too), I pretty much rearranged and played with every ingredient on there. I decided to make these pretty healthy. I used Whole Wheat flower, lessened the sugar, and switched to brown. I also wanted to extract as much zucchini flavour as I possible. So, instead of using apple sauce as my fat replacement, I made a fresh zucchini puree. And hey, why not try and cram some oatmeal in there as well? Leading me to make oat flower from quick cooking oats and throwing that into the mix. 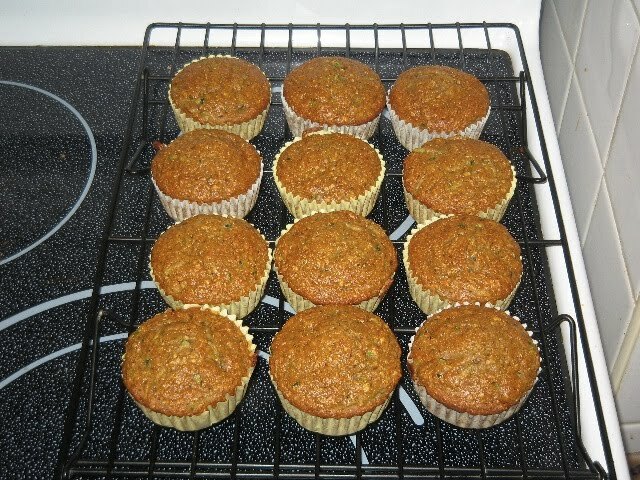 But here was the rub and what ultimately makes me call these muffins unsuccessful. I didn't have any cinnamon. I have plenty of cinnamon sticks, but my Magic Bullet, which I use as a spice grinder, was stolen (with my permission i.e. my fault) by my brother and taken to his place. Consequently I'm sitting there with most of the recipe built and not a lick of pre ground cinnamon. Since there was NO chance I was going to eat up 15 minutes trying to manually grate an entire tsp of cinnamon (oh yeah, you say it's only a tsp, well you try it :)), I reached for my trusty allspice. When the muffins came out of the oven they were super moist, but unfortunately the zucchini flavour was no where to be found. But hey, whose that I taste? Oh, hello Mr. Allspice, I didn't expect to find you here, especially not in a purple velvet suit. 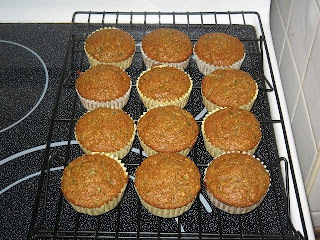 As a result these turned into more of a spice muffin then a zucchini muffin. Even though they were tasty, I'm still chalking this experiment up as a failure. I have a feeling that part of the problem lies in the size of the zucchini. There is little flavour in the flesh of a zucchini, and when they are so large there is proportionately so much of it. Next time I will try using a standard size zucchini. I probably also should have accounted for the potency of allspice and reduced the amount by half. But, as always, hindsight is 20/20 (some might say 50/50, but not I). Recipe yields 12 standard muffins and 8 mini muffins (at least it did for me). Adjust rack to top third of oven and preheat oven to 400F. Line or grease standard and mini muffin tins. Steam raw zucchini for 5 minutes, place in food processor and run until smooth. Set aside and allow to cool. Add quick cooking oats to food processor and pulse until texture is uniform and fine. In a medium bowl combine flower, oats, baking soda, baking powder, spice, and salt. In a separate bowl add sugar to puree and combine. Stir in egg, milk and vanilla until fully incorporated. Add dry ingredients to wet and stir until just combined. Fold in shredded zucchini. Place in oven and bake for 20 minutes. If muffins are not done at 20 minutes, reduce heat to 350F and bake until toothpick comes out clean (mine were done at the 20 minute mark). Bake for 12 minutes at 400F. If muffins are not done after 12 minutes reduce heat to 350F and bake until toothpick comes out clean. Let muffins sit in tins for 10 minutes before removing. Pray you can taste zucchini :).